Goalkeeper Mathew Ryan wants Brighton & Hove Albion to better their first half of the Premier League season in their next 19 league games. The Seagulls have 22 points at the halfway stage of the season and are ten points clear of the bottom three. 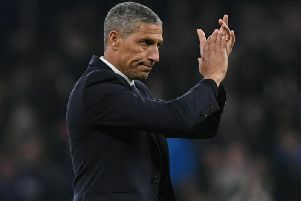 Ryan wants Albion to better that total in the second half of the season and said: "That's the minimum, 22 more points, and hopefully a bit more. "We'll definitely be looking to improve on the clean sheets defensively. We are a team who have based ourselves on that since I've arrived and long before that and it's a little bit disappointing to only be boasting three clean sheets. "Of late especially, we've been giving up goals a little bit too easily for this level of football. "It's hard to put my finger on it but teams are creating chances a little bit too easily and it hasn't been sitting well with anyone of us. Hopefully we can tighten that to begin with and I always say if you don't concede a goal in a game, the worst case scenario is you draw the game 0-0. "We seem to be creating a lot more and scoring a lot more this season than what we did last year. "If we can tighten up the defence then I'm sure we'll go ahead and win many more games." Ryan has joined up with Australia for the Asian Cup, so either David Button or Jason Steele will be in goal tomorrow when Albion host Everton.